For most people, October 3, 2015, will probably be just another autumn Saturday filled with football games, trips to the mall and other forms of recreation. For the mortgage lending industry, however, the date is looming like a bureaucratic version of D-Day. October 3 is the day when the Consumer Financial Protection Bureau’s new mortgage disclosure rule goes into effect. It requires lenders to combine information from the existing forms into two separate disclosures for most residential mortgage applications filed on or after that date. 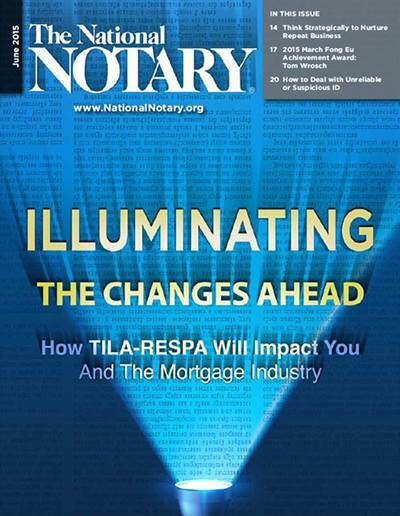 While it seems like a simple event, the TILA-RESPA Integrated Disclosures (TRID) rule, as it is being called, runs 1,888 pages and will impact everyone along the mortgage origination chain — from lenders and title companies to Notaries who take on loan signing assignments. In fact, the rule is creating so much anxiety within the industry that a coalition of 17 major trade and consumer organizations — including the American Bankers Association, American Escrow Association, Mortgage Bankers Association, National Association of Realtors, the National Association of Home Builders and the Center for Responsible Lending — jointly wrote to CFPB Director Richard Cordray urging him to implement a “grace period” for companies making a good faith effort to comply with the rule before enforcing it. “Understanding how to properly implement and comply with this uniquely complex regulation will not become clear until guidance is provided and stakeholders have experience using these new forms and processes,” the letter writers argued. The part of the rule most affecting signing agents is the Closing Disclosure, which consolidates the Truth-in-Lending (TIL) disclosure and the HUD-1 Settlement Statement. While the mortgage industry scrambles to gear up for the disclosure rule, the impact for Notary signing agents initially may seem less daunting. That’s because you won’t start seeing the new Closing Disclosures until October 3. However, as the industry implements the rule, NSAs potentially will see substantial benefits and experience some pain points. The rule is intended to help borrowers better understand their loan terms before they reach the closing. Toward that end, it requires the Closing Disclosure to be received by the borrower at least three business days before the borrower signs the note — called the consummation. To achieve this for email and traditional mail, the documents must be sent three days prior; this means lenders will send the Closing Disclosure six days before closing. In reality, that means the Closing Disclosure will be prepared days earlier so they can be sent by the six-day deadline. Because the disclosures contain key information about the loan, it’s also possible that loan packages will be prepared well in advance of the closing. This potentially will give NSAs a major benefit of being able to schedule signings well ahead of time, instead of scrambling when the title company calls for last-minute assignments. Under current rules, borrowers may not see the final loan numbers until the signing table, often leaving NSAs to deal with shocked, frustrated or angry consumers. This was illustrated in early 2014 during a public comment period organized by the CFPB as part of its efforts to streamline the mortgage closing process (see the February 12, 2014, Notary Bulletin article, “Public to CFPB: Borrowers Need More Time to Review Loan Documents”). Faster signings also make it possible for NSAs to take on more assignments in any given day, suggests Shean, the NNA’s 2014 Notary of the Year. Once the industry adjusts to the rule, settlement services may start sending loan packages to signing agents well in advance of appointments, says Shawn Murphy, Executive Vice President of ValuAmerica, Inc., a mortgage and real estate industry technology company that provides title and closing services to lenders. Last-minute loan signings are consistently one of the most common complaints from NSAs, because they have to rearrange their schedules to wait for the loan packages to be sent via email, rush to print them out and then try to make the appointment on time. And when mistakes are made, the NSA often is blamed. When Congress passed the Dodd-Frank Wall Street Reform and Consumer Protection Act of 2010, which created the CFPB, the agency was directed to integrate the various disclosures borrowers receive during the origination process. The goal was to make the disclosures more transparent while eliminating the potential confusion caused by overlapping forms. The most immediate challenge for NSAs is the fact that the industry will almost certainly go through a very bumpy transition. Consequently, it will be important to have a clear line of communication with the lenders and title companies you work with to stay on top of their processes and expectations. For much of the industry, it’s still unclear whether the lender or settlement agent will complete and deliver the Closing Disclosure. Several of the largest lenders (including Wells Fargo, Bank of America and JPMorgan Chase) have announced that they will take responsibility for delivering the disclosures, but many others are trying to work out their procedures. The same holds true for signing table instructions. Some lenders, for example, are planning to tell NSAs to place the Closing Disclosure on top of the loan document stack while others are still working out their preferred order. NSAs will likely be dealing with confusion, overreaction and frustration among the companies that hire them. In addition, the old TIL and HUD-1 forms won’t go away completely. NSAs will see them for loans originated before August 1. Moreover, home equity loans, reverse mortgages and loans for mobile homes will continue to use the old forms. That means signing agents will have to be familiar with two types of forms. 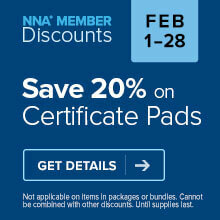 If NSAs start getting document packages early, title companies and signing services will, too. That means these companies will have more time than ever before to cherry-pick the Notary they use — unlike the current situation where companies often scramble at the last minute to find an NSA to take an assignment. The expectation is that hiring companies will have the time to schedule their top-performing agents to conduct the signings, giving more work to the best NSAs while the low performers will not get calls. The bottom line is that companies will continue to assess performance, and the high performers will come out on top. In fact, there will be greater emphasis on vetting and overseeing NSAs by title and settlement services companies because the CFPB is continually implementing new guidelines and rules to improve the borrower experience, even more than what’s in place now, predicts Shean. A recent survey of 667 mortgage lenders by a New Jersey-based mortgage industry company found that nearly 100 percent of them had either developed programs to weed out high-risk settlement agents or planned to, in large part due to the continuing regulatory changes they expect from the CFPB. Signing agents who are viewed as high performers will continue getting the plum assignments. Low-performing NSAs will lose out. Shean describes the disclosure rule as a 300-piece puzzle, and NSAs touch seven pieces — albeit seven very important pieces. But signing agents can’t just concern themselves with those seven pieces. He urges all NSAs to educate themselves about the disclosure rule. Fortunately, the industry has been so preoccupied with the countdown to disclosure day that it has created a plethora of resources, including webinars, white papers and trade reports. The CFPB also has compiled extensive resources to educate the industry. why am I required to do this every time?! Can a bank notary notarize title closing documents for the buyers. The buyers live in another city than the realtor and property. Hello Vicki. To help us answer your question, what state are you commissioned in, please?